Christopher Sherman, founder of the fine art aerial photography studio Over Austin, is drawn to drones because of the unique perspective they give to the photos they produce. The UT Tower, the Pennybacker Bridge and Lady Bird Lake each have been photographed thousands of times and from nearly every angle. So when a group of photographers wanted to shoot Austin icons from a different perspective, they went the only direction they had left — up. With recent improvements in drone technology and affordability, Austin photographers and drone enthusiasts are now capturing the essence of the city through innovative, aerial photographs. Christopher Sherman, founder of the fine art aerial photography studio Over Austin, said he has always been interested in photographing unconventional images. Sherman initially wanted to be a pilot, but after earning his Federal Aviation Administration license in high school, delved into graphic design instead. Years later, Sherman discovered photography and was specifically drawn to aerial imagery, using his flight experience to conceptualize shots taken from the air. Over the past one and a half years, Sherman has clocked nearly 350 hours of flying, capturing the Austin City Limits Music Festival, the bats exiting the Congress Avenue Bridge and the Milky Way as seen from above Austin. His work has been featured by the Austin American-Statesman, the Dell Medical School and the Austin Convention Center. Sherman uses a DJI Phantom 3 Pro, a drone that weighs four pounds and is complete with internal propellers, a compass and a GPS, which he controls externally with a joystick and an iPad. Although Sherman used his background in photography and aviation to learn the craft, others hoping to fly drones didn’t have such strong foundations. In order to create a community for other fliers, Sherman founded Austin Drone Pilots in 2015 to share experiences, tips and safety information. 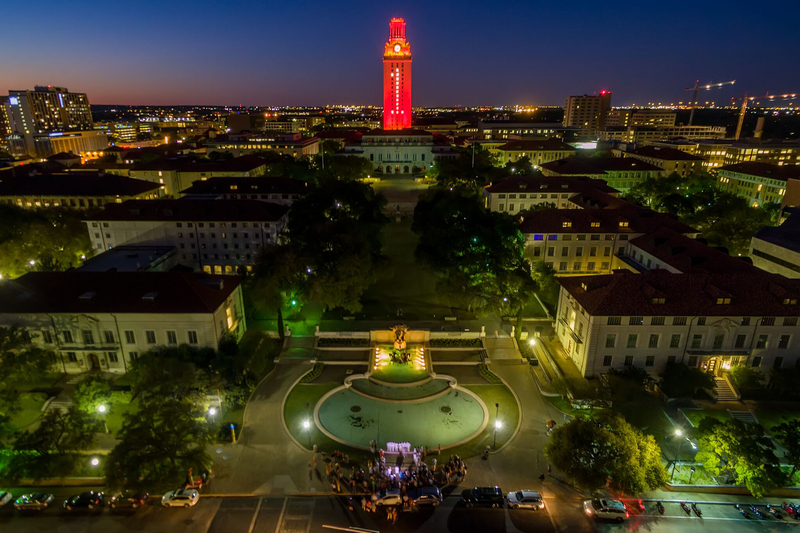 Carlos Austin, a photographer who teaches informal classes at UT, joined Austin Drone Pilots in February. Austin’s previous work included portraits, weddings and steel wool photography, but once he saw members of the group flying their drones, he said he was able to rediscover aspects of the art. Austin said Austin Drone Pilots helped ease him into the intricate world of aerial photography. Jared Tennant, a member of Austin Drone Pilots, is capitalizing on some of these opportunities. Tennant became fascinated with aerial photography in 2011 and crafted his own drone prototypes before materials became affordable. A few years later, he traveled to Panama to shoot “The Island,” a survivalist TV show hosted by Bear Grylls. Last month, he returned from a 45-day trip across nine countries, capturing footage of Thailand’s oceans and a pregnant whale giving birth in an archipelago. At one point, he sent his drone into the center of a flock of pelicans, as if the camera were one of the birds. Tennant also shoots regularly in Austin and developed a three-minute video of some of the city’s most iconic locations. He said the shots evoke feelings of nostalgia in his viewers and that he finds satisfaction in showing locals photos of their city. Tennant said he plans to continue flying drones in the future and wants to take on a more educational role.